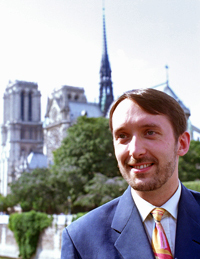 Olivier Latry, organist of the Cathedral of Notre-Dame in Paris, was born in Boulogne-sur-Mer, France, in 1962. He began piano studies at the age of seven and organ studies at age twelve. He later studied organ with Gaston Litaize. From 1981 to 1985 Mr. Latry was organist of Meaux Cathedral and at age twenty-three he won a competition to become one of the three principal organists of the Cathedral of Notre-Dame in Paris. Since 1995 he has taught at the Paris Conservatory. Not wishing to specialize in a particular repertoire, Mr. Latry is an ambassador of 17th- to 21st-century French organ music, hence his equal devotion to the art of improvisation. Today he is counted among the most noted improvisateurs in the exceptional French tradition from Charles Tournemire to Pierre Cochereau. Mr. Latry has performed in more than forty countries on five continents, appearing most often in the United States, where he made his first American tour in 1986. He has made special trips to appear for regional and national conventions of the American Guild of Organists as well as for inaugural recitals of new instruments and for major music festivals and summer schools (Westminster Choir College, McGill University, and the San Anselmo Organ Festival). Mr. Latry has a particular interest in contemporary music and has premiered works of Xavier Darasse, Claude Ballif, Thierry Pecout, Vincent Paulet, Thierry Escaich, and Jean-Louis Florentz. In 2000 Mr. Latry performed three complete cycles (six recitals each) of the organ music of Olivier Messiaen at the Cathedral of Notre-Dame in Paris, the Church of St. Ignatius Loyola in New York City, and St. Paul's Cathedral in London. In addition to concerts and teaching, Mr. Latry has made his mark through recordings, which include music of Bach, Vierne, Widor, Litaize, and the complete organ works of Maurice Duruflé and Olivier Messiaen.